We double down on Mr Papa in Canberra, a Peruvian street food van based in Lonsdale St truck hub The Hamlet. Chanchito deluxo. Perhaps a little boldly, Mr Papa claims they were established in 1981 - perhaps that's the year the owner was born, it certainly wasn't around before the birth of the information superhighway. 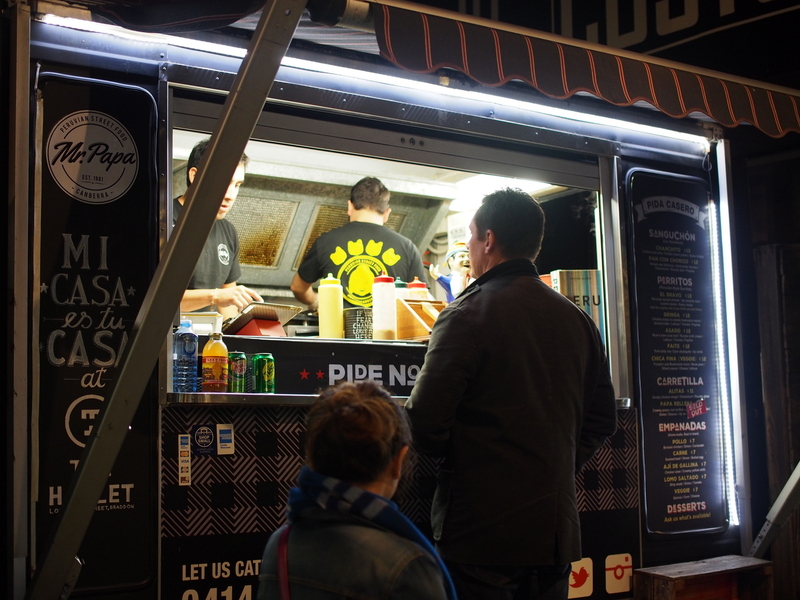 As far as we know they've been hanging around in Canberra food truck scene for a few years, now based in The Hamlet in Braddon and appearing at local food fairs like the Multicultural Food Festival. The Hamlet is busy on a Friday night, even in cold Canberra weather. The music is great, there's beers and a good happy feel all round. 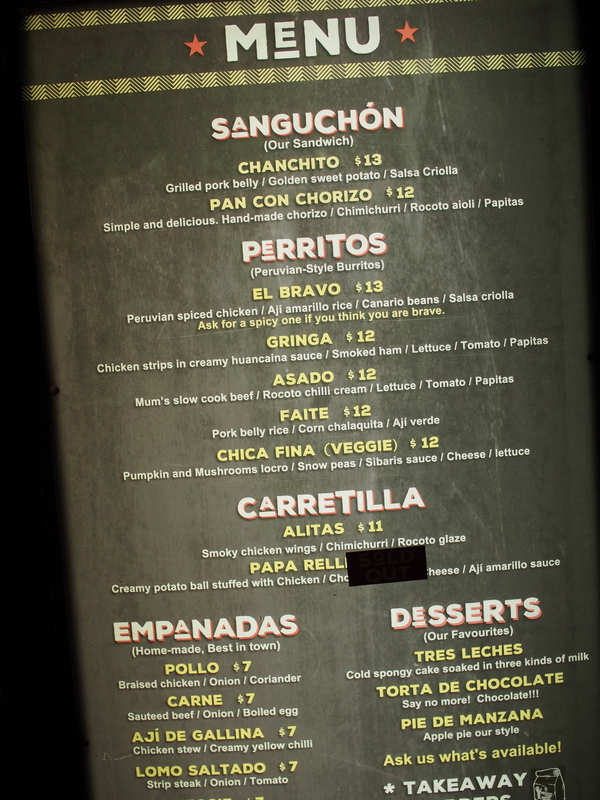 The chanchito is the hero dish of Mr Papa. A white bread bun filled with soft pork belly, slices of sweet potato, salsa and a scatter of sliced onions makes for one tasty roll. We did take a photo of one but it was badly out of focus, we blame the Bent Spoke Brewery. The next night we headed back for another round, a little more focused this time. We went back for the perritos, a Peruvian meat, cheese and veg wrap with a cheese sauce coating the cut ends and more for extra dipping. The one above is an El Bravo filled with chicken and cheese, but we loved the Asado version that we ate the night before, filled with slow cooked beef and chilli cream. 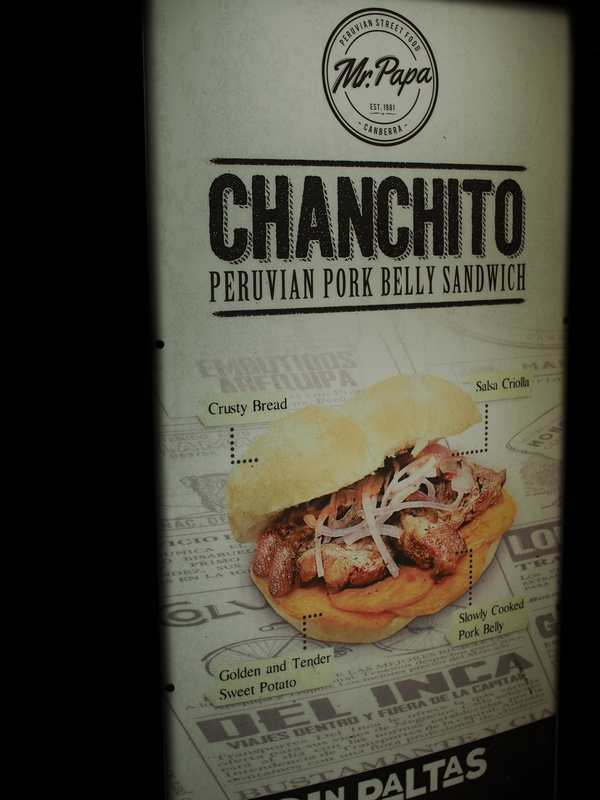 We also needed to complete the chanchito double and try the chorizo version. 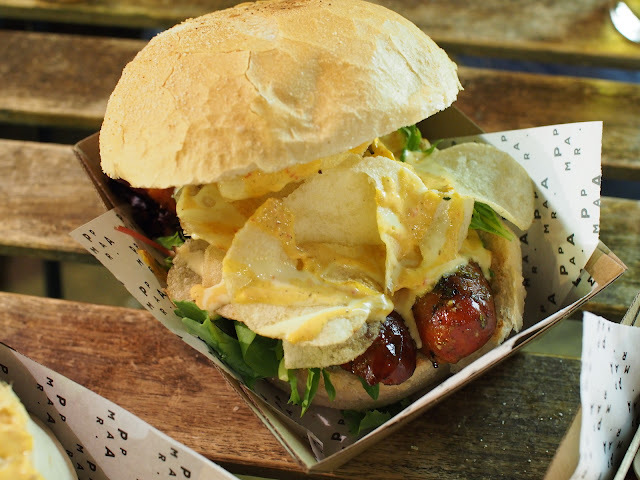 Good smoky sausage with potato crisps for that extra crunchy bite. 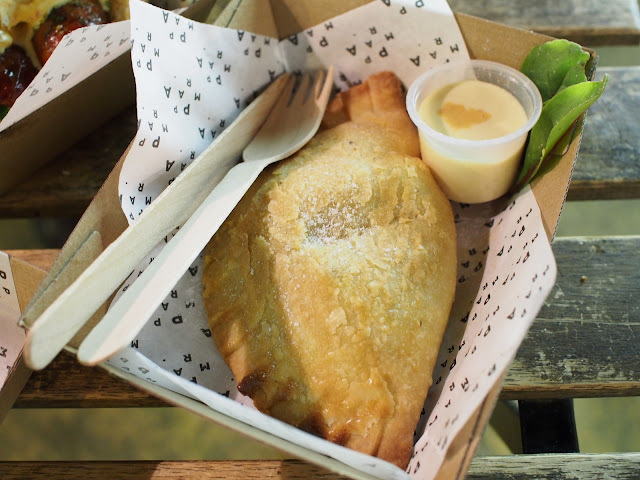 The empanadas come in a few different versions, this one was filled with beef, onion and bits of chopped boiled egg. It tasted like it had sugar sprinkled on top, not sure if that's tradition or mistake. Menu on the side of the van. Just no room for desserts, will have to go back next time. This post is brought to you by Bowie. 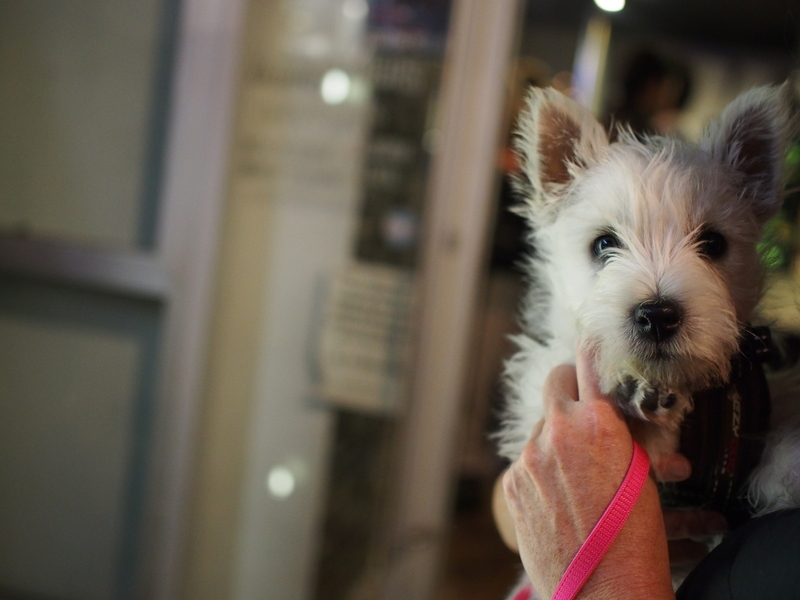 While waiting around a friendly Canberran asked us to hold her dog. We couldn't resist him. We met just about every other punter in the Hamlet afterwards with people lining up for a pat. 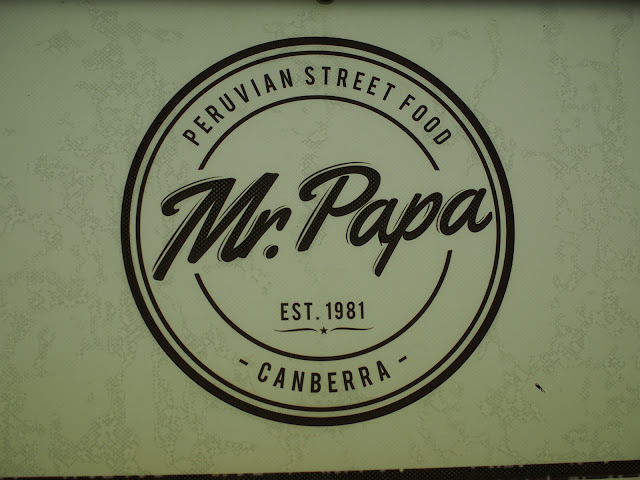 Mr Papa is at The Hamlet, 16 Lonsdale Street, Braddon. 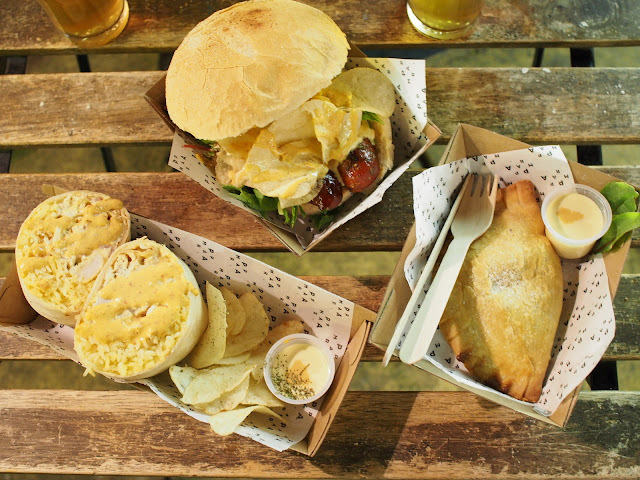 Mr Papa also has stalls at fairs and functions, keep an eye out on their site.